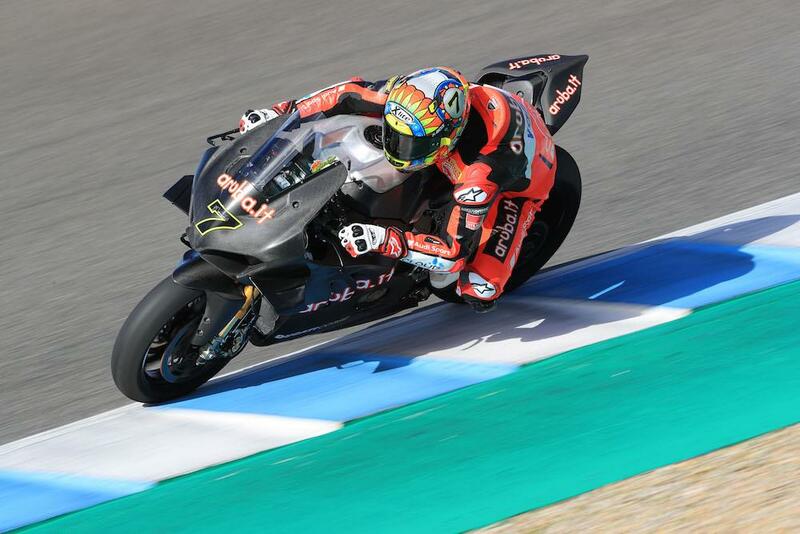 Chaz Davies has said the early signs are positive for Ducati’s new V4 R after his second test aboard the all-new bike at Jerez this week. Davies, who is thought to still be struggling with injuries from earlier in the season, rounded out the test fifth fastest, marginally slower than new team-mate Alvaro Bautista, but says he learned a lot as he continues to adapt from the v-twin Ducati to the four cylinder. Davies and Bautista had a development swingarm to test, which somewhat hampered progress as the Italian marque only had one swingarm for the duo to share during the test, with both preferring the part to the previous version. “It was a good test, a positive two days,” he said. “It felt like we learned a lot about the bike overall. We’ve only got one particular swingarm which we have shared between both of us and it gives some benefits so we are just figuring it out bit by bit. “I did a race distance several times on tyres which I was actually really, really encouraged by because the drop off wasn’t too bad. I had a good feeling with the bike when it loses grip and I felt like it was working good at that point which is a nice surprise. Normally it is something you have to work for. “It is there to be had but it is about putting it all together at the right moment. That’s been the story of the two days. At no point have I gone, that’s good, that’s good and that’s good let’s put it all together and go for a lap time. We are still not quite there with the jigsaw puzzle.